Breaking streetstyle stereotypes, Puma has partnered with contemporary Chinese label, SANKUANZ for a utilitarian-influenced SS19 collection. The emerging fashion label helmed by LVMH Prize Semi-Finalist Shangguan Zhe has been making waves in international fashion week circuits for his unique spin of uniform dressing. Pairing fragments of contemporary art with vintage sportswear and sleek uniforms, Shangguan Zhe reinterprets streetwear with a rebellious voice. Going with the theme 'Kill the Wall', his designs are symbolically charged, conjuring up images which encapsulate subcultures. An eclectic mix of new and traditional patterns, the collection features un-conventional prints and bright logo typefaces to create a bold and neutral collection. The capsule collection of footwear and apparel highlights custom editions of the Cali, Cell Endura and RS-X silhouettes. Characterized by neutral earthy tones with flashes of vibrant neon pops, these kicks sport over-exaggerated soles for a tougher look. 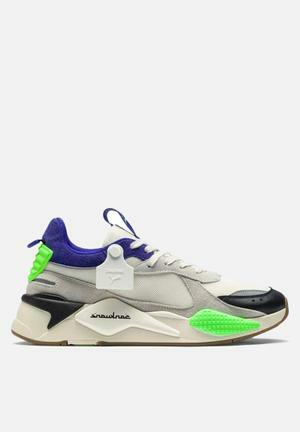 The original retro-running silhouette from the 90s, the Cell Endura SANKUANZ comes with contrast blocky neon and reflective overlays. The bold chunky sole with striking translucent coloured pods features PUMA's innovative CELL cushioning technology. An evolution of the court sneaker, the Cali SANKUANZ is built with a smooth suede and tonal leather upper, contrast leather lining and a thick moulded rubber toe bumper. To achieve a chunkier look, the shoes are decked with a heavily textured rubber sole and exaggerated moulded rubber inserts on toe and heel. Debossed SANKUANZ script on the outer heel and an all-over graphic footbed completes the look. 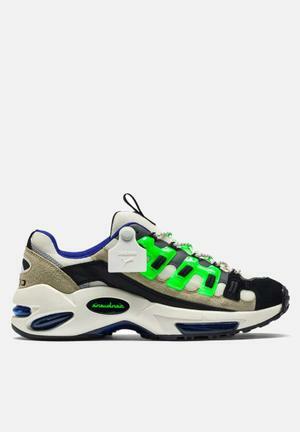 The RS-X SANKUANZ is an innovative and futuristic silhouette inspired by archive PUMS RS Styles. With contrast blocky neon and reflective overlays, it's fitted with a sculpted layered sole featuring PUMA's comfortable RS (Running System) cushioning technology and a translucent rubber heel counter.